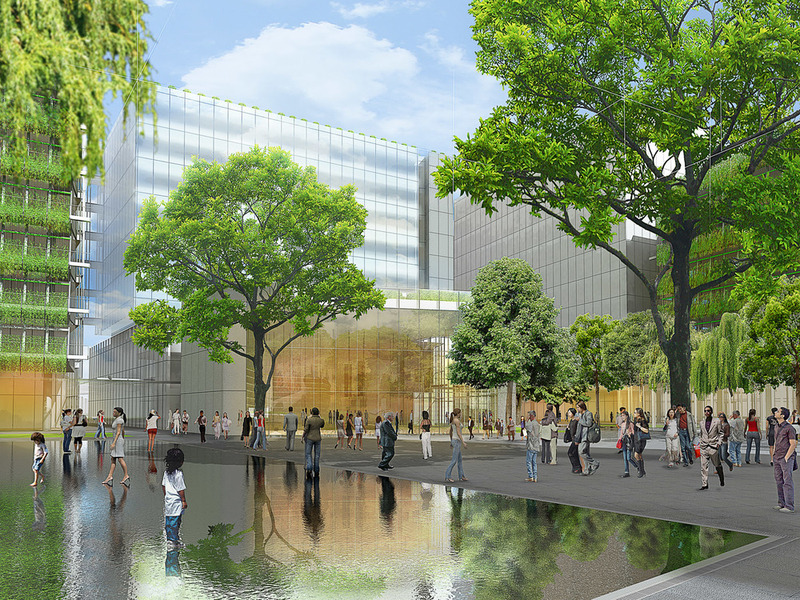 Rana Creek is collaborating with Renzo Piano Building Workshop on the landscape design for a large mixed-use development which will serve as the headquarters for JNBY, a fashion design company. This urban infill project also includes commercial, retail, and office space, as well as an art gallery and outdoor public performance space. The landscape incorporates a dense tree canopy of native hardwoods, and ground plane plantings that offer seasonal interest and accentuate the architect’s stiking axial, pedestrian-oriented site design. A series of sunken courtyards (shi-tang) host a variety of ornamental flowering trees and open, interactive terraced spaces. In the main piazza, a large water mirror over black granite provides a central focal point, adjacent to an outdoor entertainment space and art gallery. Living roofs planted with tea plants reduce rainwater runoff while helping to cool buildings on hot summer days. Extensive living walls face the interior courtyard and were designed to decrease energy loads for cooling, reduce light intensity, and improve interior comfort, while also providing habitat and year-round seasonal interest to the exterior.